The City of St. Charles and the St. Charles Park District have developed a Coyote Management Plan to maintain public safety as coyotes are known to frequent St. Charles and the surrounding area. Human safety is the top priority of this management plan which outlines tactics for safe coexistence with local coyotes. This plan aligns with strategies adopted by nearby communities. Why do we have to coexist with coyotes? Because coyotes are native to Illinois and are common across the entire state, it is important to learn to safely coexist with them. Coyotes also serve an important role in local ecosystems by keeping populations of smaller wild animals and vermin in check. We can expect an increase in coyote sightings in the area between late winter and early spring as young coyotes leave their parents in search of mates and territories to call their own. And, with the onset of winter, coyotes are more willing to venture out of their rural or wooded habitats and into residential areas in search of food and shelter. While coyotes are unlikely to attack humans, they can become more aggressive if they find an area that suits their needs and they want to defend it. Hunting is not allowed within city limits according to Ordinance 9.60.030, and firearms and/or traps are not permitted on Park District property. Studies have shown that trapping or hunting programs are largely ineffective. If the conditions that lured the coyotes to an area still exist, hunting or trapping will only temporarily remove them. And it won’t be long before other coyotes move in to replace them. 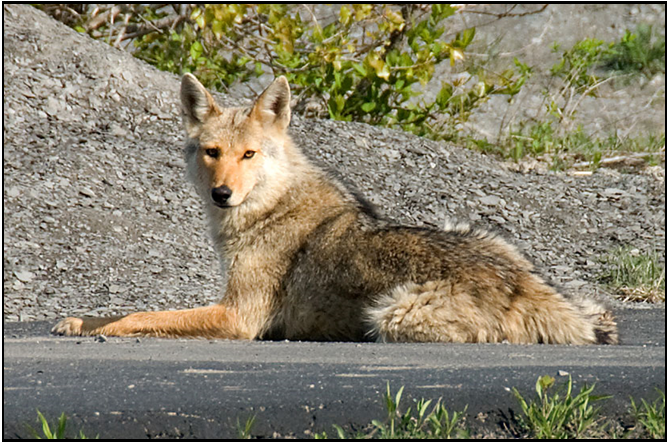 This Coyote Management Plan outlines strategies residents can safely enact to help keep coyotes from settling in their neighborhood. If you have questions about the plan, please contact us at 630.377.4400.